Chem. Eur. J., 21 (43), 15320–15327, (2015). DOI: 10.1002/chem.201501233. Functional-group-oriented polymerization strategies have contributed significantly to the initial development of porous polymers and have led to the utilization of several well-known organic transformations in the synthesis of these polymers. Because there are multiple polymerization routes that can be used to introduce the same chemical functionality, it is very important to demonstrate the effect of different polymerization routes on the gas-sorption properties of these chemically similar polymers. 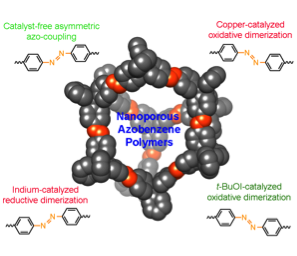 Herein, we have studied the rich chemistry of azobenzenes and synthesized four chemically similar nanoporous azobenzene polymers (NABs) with surface areas of up to 1021 m2 g−1. The polymerization routes have a significant impact on the pore-size distributions of the NABs, which directly affects the temperature dependence of the CO2/N2 selectivity. A pore-width maximum of 6–8 Å, narrow pore-size distribution, and small particle size (20–30 nm) were very critical for high CO2/N2 selectivity and N2 phobicity, which is associated with azo linkages and realized at warm temperatures. Our findings collectively suggest that an investigation of different polymerization routes for the same chemical functionalization is critical to understand fully the combined effect of textural properties, local environment, and chemical functionalization on the gas-sorption properties of nanoporous polymers.